It’s easy to take fish for granted. You forget how impressive it is that they manage to live in a vastly different environment to us. Thinking about the life of a fish, leads to lots of questions like ‘how do fish mate?’ and ‘do they sleep?’. Fish need oxygen just like humans do, but because they live in water it doesn’t seem like they’d be able to drown. They’ve adapted gills which let them extract oxygen from the water, so is it possible to drown when they can breathe in water? As humans we need oxygen to breathe; fish are no different. Instead of taking oxygen from the air like us, they collect dissolved oxygen from the water as they swim. There’s a lot more oxygen in the air than there is in water. This makes it much easier to get oxygen when living on land, but fish have evolved gills to let them survive in water. Breathing in water has its problems, the salt levels of water can vary a lot. Saltwater fish absorb a large amount of salt while respiring because it’s in the water. Consequently, they need a specialized mechanism to remove excess salt from their body. Freshwater fish have the opposite problem. There isn’t much salt in the water, so they need a mechanism to hold on to as much of it as they can. Fish need oxygen for the same reason as humans. Without it they’ll struggle to respire, and eventually die. Oxygen gets combined with other elements to create proteins and even form new cells. When breaking down food in the body, oxygen is used to convert and store its energy. This energy is used in all active processes within the body. Fish don’t need quite as much oxygen as us since they’re cold blooded. Warm blooded animals need extra energy to keep the body heated. Fish don’t need this energy, so they can survive with less food and oxygen. There’s a finite amount of oxygen in a body of water. The larger the body of water, the larger surface area and as a result the more oxygen. In an aquarium this can be a big problem. There’s only a small amount of water, meaning it can quickly run out of oxygen. This is just one reason why tank size is so important. 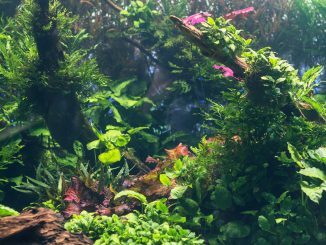 Aquarists can use plants to introduce a some oxygen into the tank as they photosynthesize. Air pumps are useful too as they bring oxygen depleted water up to the surface, forming a small circulation. Typically, fish don’t have lungs. Most of them that you’ll ever see or hear about will have a set of gills on either side of their body; however this isn’t the case for all fish. There’s a group of fish called Lungfishes. As you can guess from the name, they have air-breathing lungs instead of gills. 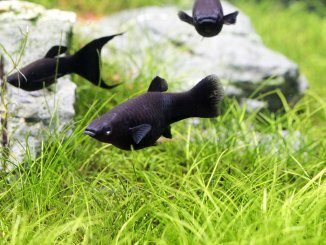 They’re a small group of six freshwater species which can only be found in Africa, Australia, and South America. African and South American species can survive their habitat drying out by burrowing into the substrate and entering a state similar to hibernation. They do this by slowing their metabolism down to 1/60th of its normal rate. 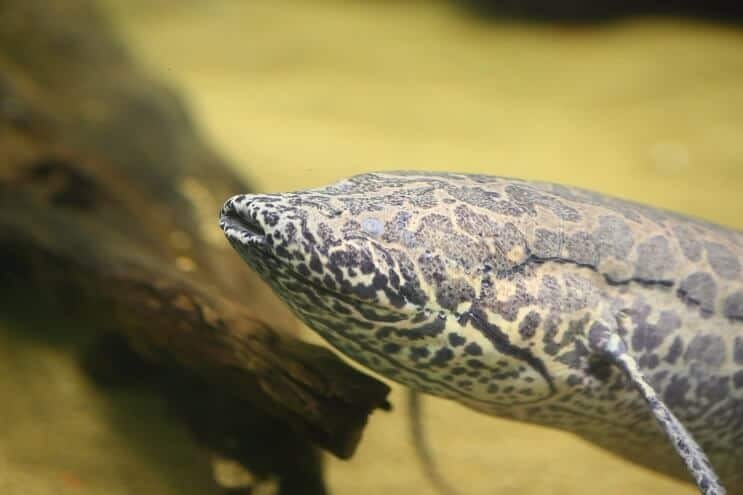 There used to be a lot more lungfish and they were spread throughout a larger network of freshwater rivers and lakes. Their numbers have gone down dramatically since Pangaea broke apart. Lungfish aren’t the only fish that can breathe air, some have a labyrinth organ. This organ act like a lung, letting fish take oxygen from the air rather than water. It’s not usually present in juveniles, they start with gills and later grow labyrinth organs. 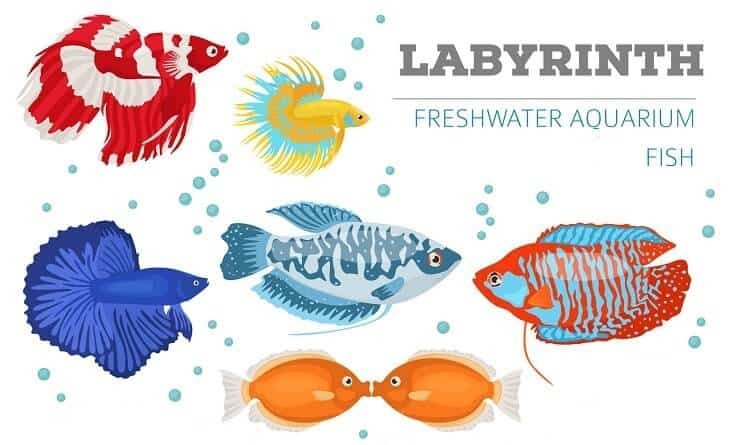 Lots of aquarium fish have labyrinth organs, like kissing gouramis and crowntail bettas. While breathing air is a primitive trait for fish, it can let them live in waters that might not be survivable for any fish respiring in the polluted water. However in most places the water is perfectly safe, so fish don’t need lungs to breathe air because there’s enough oxygen in the water. Instead, fish have gills, which are perfectly adapted for collecting this oxygen. Before we can answer the question “can fish drown?” we need to look at how fish get oxygen and how they breathe. Since there’s less oxygen in water compared to air, you need more efficient gas exchange surfaces in order to collect it. Fish have gills which are able to take in oxygen when it’s just at 5 parts per million (ppm). We breathe air, 21% of which is oxygen (210,000 ppm). It’s not just about efficiency though, gas exchange surfaces (like gills and lungs) need to be able to deal with the medium you’re in (air or water). For example, our lungs can force air in and out, but we’d suffocate if water filled them. So how do gills work? Well firstly water needs to pass across them, which is controlled by the operculum (this is a flap of skin that acts as a boundary between the mouth and the gills). The fish lowers the floor of their mouth. This makes the pressure in the mouth lower than the pressure outside, so water is drawn in. When the fish raises the floor of their mouth, the pressure inside becomes higher than the pressure outside. This forces water out of the mouth through the operculum, and across the gills. If you keep fish at home you can watch this happen, the operculum moves each breathe. This sight is one of many reasons to keep fish. To extract oxygen from the water, the gills need a large surface area. A bigger surface means as much water as possible can come into contact with the gills for oxygen to diffuse across. 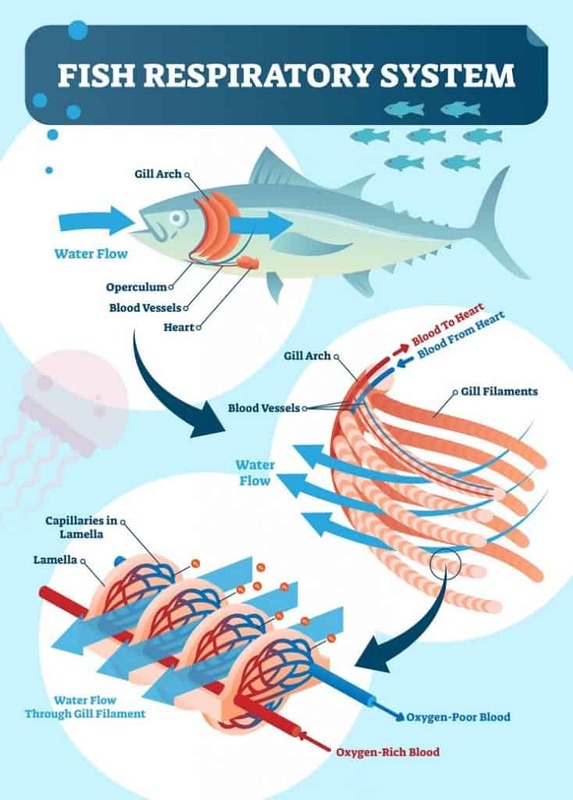 When the water comes into contact with the gills the oxygen is transferred from the water to the blood via the edge of the lamellae. Each gill arch holds rows of filaments and lamellae, creating a car radiator-like appearance. Gill anatomy can get a bit confusing, but here’s a basic overview. To answer this, we need to think about the definition of the word “drown”. This is a verb defined as when you “die through submersion in and inhalation of water”. With humans, when water gets in our lungs we can’t get oxygen from it, so we can’t breathe, and therefore, we die. We have already learnt however, that fish can extract dissolved oxygen from water, so fish are physically incapable of drowning. If fish are taken out of water then they’ll die, but not due submersion or inhalation of water, so they’re not drowning. If there’s not enough dissolved oxygen in the water, then they’ll die because they can’t breathe. 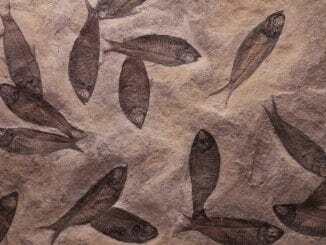 You could argue that the fish has died through “submersion in and inhalation of water”, because the water inhaled doesn’t contain enough oxygen. This doesn’t fully meet the definition though. So, if you’ve wondered can fish drown, the answer is probably no. A more accurate term is probably that fish “suffocate” when there isn’t enough oxygen for them to breathe. To suffocate is defined as to “die from lack of air or inability to breathe”. 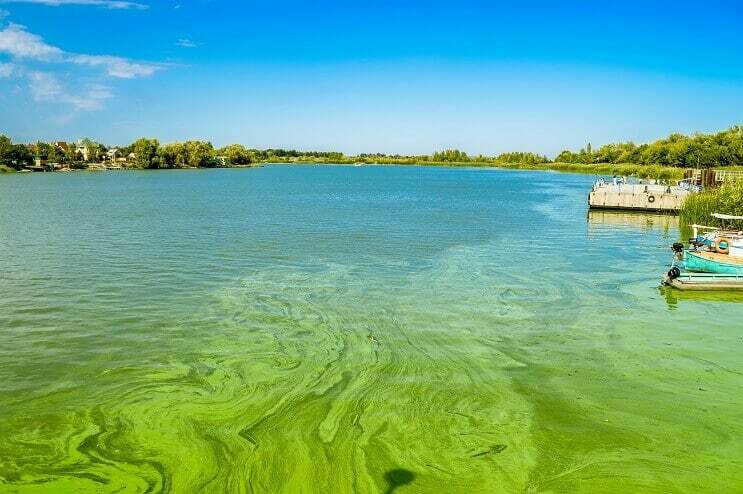 Algae bloom in a river can reduce the amount of oxygen available to fish in the water. When fish are out of water they still have access to oxygen, and at a much higher concentration. You might wonder what causes them to die if they can still breathe. Well the answer is that they can’t breathe, but it’s not due to a lack of oxygen. They can’t breathe, because gills aren’t designed to process air, but that doesn’t mean that they can’t do it. The issue is that the air dries them out so that they can no longer function properly. It’s like being dehydrated. 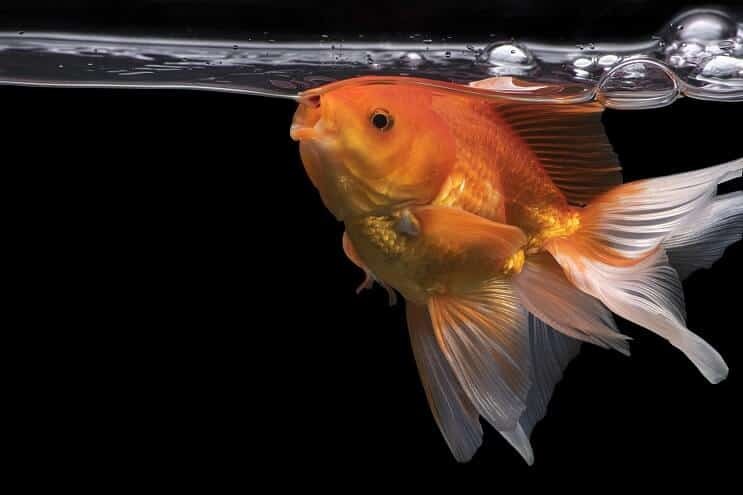 When living in water, a fish’s body stays moist. Since gills are designed to be moist, they don’t work if they dry up out of water. A fish can suffocate in water as well as out of it. There are lots of ways this could happen. Any damage to the gills is going to reduce their efficiency in collecting oxygen, potentially to a point where they can’t get enough to survive. Damage could come through fighting or disease. Other causes of suffocation are things that lower the concentration of oxygen in the water. An increase in population size is a good example, more fish are respiring and using up the oxygen. Oxygen can run out if it’s not being replenished fast enough. In an aquarium this can happen quickly because they usually contain such a small body of water. In a natural environment pollution can lead to a rapid de-oxygenation of water that can’t be replaced fast enough. If we’re being critical then fish can’t really drown; but taking a fish out of water is similar to putting a human in it. In both cases the subject can’t breathe in the new environment. Gills and lungs are designed for use in water or air, and they’re much more efficient in their natural habitat than the other. By considering the word “drown” you realize that fish don’t die through the inhalation of water. So while fish can’t drown, they can go through a similar experience when out of water or oxygen.